It's been a bit slow on HAIF recently, so I've decided to bring you a short listing of the businesses, circa 1986, from the Chron. Not all of the article is reproduced (© concerns, afterall). It includes some interesting tidbits, like the Tower Theater being restored as a live theater in 1984, and the fact that several old structures were demolished at this time. I've read on HAIF that they wanted to close Lower Westheimer to vehicular traffic sometime in the 1980s--this is the kind of things that Westheimer was offering at the time. Do you remember any of these? (not Felix or anything still there, like Numbers). When I have time, I might transcribe some of the "modern" equivalents based on address. We've included some of the larger shops, restaurants and landmarks, but things are changing for the better all the time. A trip to lower Westheimer on any weekend - day or night - might offer new discoveries. Radio Music Theater: A unique form of nightclub entertainment, which has now even been copied in other cities, Radio Music Theater began here in Houston and could well travel beyond it. Three actors (Steve and Vicki Farrell, Ken Polk) revive the golden days of radio but with modern topical twists. Current review "Fear of Ducks" ends soon. Shows are 8:30 p.m. Thursday-Saturday and 11 p.m. Saturday. 1840 Westheimer; 522-7722. Driscoll Street Cafe: 1834 Westheimer. 522-7020. This restaurant came under new management last fall, but kept the same name. Let there be no confusion, because changes have been made: The menu has been altered to show a decidedly Cajun flavor, and piano bar music is now presented live most nights. 11 a.m. to 11 p.m. Monday through Saturday. 11 a.m. to 10 p.m. Sunday (brunch on Sunday). Bar open later. Westheimer Flea Market: Glassware, antiques, collectibles, furniture, books, plants, jewelry and the best of the '50s are all gathered under one roof in this aggregation of some 30 shops. Hours are 10 a.m.-6 p.m. Monday-Saturday. 1733 Westheimer; 528-1015. Cut Loose: Spiked, sprayed or shredded, hair comes out in novel ways in this tonsorial parlor that suits radical tastes. Hours are 10 p.m.-6 p.m. Tuesday through Saturday. 1711 Westheimer; 520-7401. Pearl's Oyster Bar: Originally a Baptist church, it first became a restaurant 14 years ago and has remained in the same hands to the present. Manager Brandon Broussard says that the facade and parking lot are both the same as they were in 1927 when the church was built. Inside, the high cathedral ceiling and arched windows also remain. Oyster nachos, boiled shrimp, oyster bar, catfish served 11:30 a.m.-2:30 p.m. Monday-Friday and 5:30-11 p.m. daily. 1658 Westheimer; 523-4982. Timeless Taffeta: There's always something weird and wonderful (like a poodle-skirted mannequin with sunglasses and a blond wig) standing outside to greet shoppers. The 6-year old store is stocked with a range of vintage clothing, costumes and accessories. Hours are 11 a.m.-7 p.m. Monday-Saturday, noon-6 p.m. Sunday. 1623 Westheimer; 529-6299. Mr. Peabody's Wayback Machine: The twin brother to Timeless Taffeta, Mr. Peabody's is located in the same strip center and has much the same offering. Owner Mary Haberlein-Landingham has been in the current location for six years. Hours are 11 a.m.-6 p.m. Monday-Saturday, noon-5 p.m. Sunday. 1613 Westheimer; 521-9424. Firehouse Community Center and Gallery: Formerly Fire Station No. 16 (dedicated 1923) now serves as a community meeting place for groups such as the Neartown Association, Citizens' Environmental Coalition, Bayou Preservation Association, The Park People and Women's Caucus for Art, which has a permanent gallery in the old fire truck bay. 1413 Westheimer. 520-7840. Sheer Insanity: An amazing collection of trendy and unusual gifts and novelty items, toys, cards, accessories and clothing. This shop has a second location in the Village. Hours are 11 a.m.-9 p.m. Monday-Saturday. 1424 Westheimer; 526-9522. The Daiquiri Factory: The frozen cocktail gets its own haven here, including such delicacies as the Triple Bypass, containing bourbon, rum, amaretto and fruit juice. Hours are 3 p.m.-midnight daily, until 2 a.m. Friday and Saturday. 1423-B Westheimer; 523-7008. Hollywood on the Curve: Memorabilia reproductions and original movie posters, greeting cards, gifts and postcards, most with movie themes. Owner Mary Norris says she also runs a search service for people looking for certain hard-to-find movie posters. Hours are 10:30 a.m.-10 p.m. Monday-Friday, noon-10 p.m. Saturday, noon-6 p.m. Sundays. 1422 Westheimer; 522-4485. Dragon and the Rat: Helium balloons, gifts, posters, cards, custom framing and novelty items. Hours are 11 a.m.-8 p.m. Monday-Saturday, 12:30 p.m.-7 p.m. Sundays. 1416 Westheimer; 520-2822. Manhattan Cards and Hair: The strange combination of a beauty shop and card/gift shop. Besides the regular merchandise available in the store, owners David Fowler and Norman Guttman boast the largest collection of red plastic (more than 10,000 pieces) in the world. Hours are 10 a.m.-9 p.m. Monday-Saturday, noon-6 p.m. Sunday. 1412 Westheimer; 522-2822. Wear It Again Sam: (Formerly Stop the Clock) Men and women's vintage clothes, collectibles, shoes and a large collection of old costume jewelry. Among the shop's claim to fame: Annie Lennox (of the band Eurythmics) shopped here when she was in town two years ago. Hours are noon-6 p.m. Monday-Friday, 11 a.m.-6 p.m. Saturday, 1 p.m.-6 p.m. Sunday. Closed Tuesday. 1411 Westheimer; 523-5258. Ding-a-Ling Monkeeshines: It's a jungle in here but not dangerous. Owner Kevin McGinnis (SEE CORRECTION) is king of the beasts, presiding over the many species of small stuffed animals and balloons for every occasion. But this is an all-service entertainment" place that also delivers singing telegrams and provides belly dancers for special occasions. Hours are 9 a.m.-5 p.m. Monday-Friday, 10 a.m.-6 p.m. Saturday. 1408 Westheimer; 521-0565. Creative Neon: Without a doubt the flashiest store on lower Westheimer, this shop is the lighthouse for the curve. A stunning display of neon fills the windows. Owner Hank Iglecia is the dean" of shop owners on the curve, serving as informal organizer of the Shop the Curve shop owners group and creator of the Shop the Curve sign. Creative Neon makes custom neon to order, but shoppers also can choose from a small gift line of sculptures and mirrors available in the shop. Hours are 10 a.m.-midnight daily. 1403 Westheimer; 523-0783. The Fashion Lab: Off the rack, one-of-a-kind designer clothing, swimsuits to evening gowns for men and women (priced from $37.50 to $600) by designer Ken Simmons. His workroom is on the premises. Simmons says he also offers a custom design service, where he will design an outfit for a certain party or event. Hours are 11 a.m.-5:30 p.m. Monday-Friday, noon-5:30 p.m. Saturday and Sunday and by appointment. 1403 Westheimer (upstairs); 523-0783. Quality Custom Framing: Owner Tim Subcliffe says he offers custom framing at do-it-yourself prices. Also, some posters for sale and mini-gallery of framed graphics and photography for browsers. Hours are 10 a.m.-7 p.m. Monday-Saturday. 1403 Westheimer; 520-7880. Appearances: Men's sportswear and casual cotton clothing. Owner Lynn Richard says he likes to offer not-too-trendy" styles. Hours are 11 a.m.-7 p.m. Monday-Saturday. Closed Sunday. 521-9450. The Flat Earth: A record store offering what owner Ed Pickens calls alternative music," as well as domestic and dance music. The shop has a listening area with couches and chairs. Pickens says he wants customers to feel comfortable about listening to the music before they buy. Hours are 11 a.m.-8 p.m. Monday-Saturday, 1-6 p.m. Sunday. 527-8885. Texas Tanning: A tanning salon. Owner Chris McCormick says the tanning beds used are the largest available. The chain also has stores in Woodlake and Clear Lake. Hours are 7 a.m.-11 p.m. Monday-Friday, 9 a.m.-7 p.m. Saturday and Sunday. 526-5620. 42nd Street and Times Square : Big collection of sunglasses, costume jewelry and sports clothes. Hours are 11 a.m.-10 p.m. Monday-Thursday, 11 a.m.-midnight Friday and Saturday, 11 a.m.-7 p.m. Sunday. 521-1134. Et Vous/Cherryhurst Wine Bar: A sleek and small wine bar with paintings on the wall and dramatic lighting and decor. Hours are 8 p.m.-midnight Sunday-Thursday, 8 p.m.-1 a.m. Friday and Saturday. Closed Monday and Tuesday. 522-9009. Renu's Thai Restaurant: Thai cuisine. Hours are 11 a.m. to 10 p.m. Tuesday-Saturday and 5 p.m.-10 p.m. Sunday. 1230 Westheimer; 528-6998. The Tower Theater: The theater holds it head up high as the neighborhood's bringer of culture and enlightenment, in the form of everything from Lily Tomlin and Laurie Anderson to touring productions of "Agnes of God" and "Noises Off". The compact and cozy hall was bought and restored by Pace Theatrical in 1984. 1201 Westheimer; 529-5966 or 529-7444. Felix's Mexican: Totally traditional Mexican food, right across the street from Tila's, but neither restaurant seems to mind the competition. Felix's has been in this location since the late '30s and may be the oldest restaurant on the block. Hours are 11 a.m.-9:45 p.m. daily. 904 Westheimer; 529-3949. Ruggles's Seafood and Club Flamingo: Adapting to the environment, Ruggles recently lightened up its interior and lightened the menu to give fish first place. Sensibly priced but not common (escargots in a boiling lava of herb butter), fresh and creatively presented (example of smart move: dinner salad prices gradated according to number of persons). Open Monday through Friday for lunch, seven days a week for dinner until 11 p.m. Adjacent Birdwatcher's brought live jazz to Westheimer once and will again as soon as Club Flamingo is ready to open as a cabaret May 8. 903 Westheimer; 524-3839. Tila's Cantina and Tacqueria: The neon clock on the outside tells the customer that it's always time for the Mexican food of this hardy, distinctive (black beans instead of "refritos") lower Westheimer restaurant. Recently, the menu was expanded and portions enlarged, the choices beginning with red sauce or creamy roast tomatilla. Hours are 11 a.m.-11 p.m. Tuesday-Sunday, until midnight Friday and Saturday. Closed Monday. 616 Westheimer; 520-6315. Michelangelo's Italian: Michelangelo Predozin came to this country from Venice (not the one in California) 23 years ago, and his restaurant is going on 16 years in this location. His pasta and veal remain favorites for many Houstonians. Hours are 11:30-10 p.m. daily, until 11 p.m. Friday and Saturday. 307 Westheimer; 524-7836. Numbers: This nightclub is the bastion of the Judy's, headquarters for the Cult and Divinyls and other musical groups beyond the pale of top-40 radio, but just the cup of tea for adventurous pop fans and dance-all-night dervishes. Hours are 9 p.m.-2 a.m. Wednesday-Saturday. 300 Westheimer; 526-8338 (concert line), 526-6551. Cafe L.A.: This cafe with live entertainment opened last July with a laid-back West Coast atmosphere. Folk and rock but no hard rock or heavy metal - too hard on those laid-back ears. Open for lunch and dinner Monday through Friday and until 3 a.m. on Friday and Saturday to catch the after-club crowd. With an oyster bar, seafood, omelets, fajitas and a Sunday brunch. 243 Westheimer; 529-0099. The article's name was "The Wacky World of Lower Westheimer". I've only lived in this area since 2005 but wondered when the plant place went in next to HPD storefront? Actually when was the Horse shaped Topiary planted at the curb in front of the HPD storefront was put there--any ideas? why a horse? By the way, one of the things I cut from the article was the mention of the police substation moving in, which had a neon badge as one of its features. I've thinking about that neon badge sign. Why tear it down? I think that would have really added to the night time shots with the TowerTheater marquee in the background. I had heard the "M" sign at Bagby & Elgin might get a redo by the MMD--- maybe a little neon would perk it up also. Wasn't the original Tila's building with the neon demolished at some point? I do remember buying cards at Sheer Insanity. I was really hoping Creative Neon would be the current Light Unlimited. But on Google maps it looks like maybe that weird little spy gadget store? Or the strip center behind it? The only one on the list I've been to is Numbers. Fashion lab rings a bell... Was it possibly turned into a used clothing store? and moved somewhere else in the area? -Yeah, pretty slow on HAIF when I'm commenting in the historic section. Yes. Katz's is located on the site where Tila's used to be. The old Tila's building was set farther back from the street than Katz's is. With the amount of buildings demolished at the time, I wonder why they didn't widen that narrow part of Westheimer when they had the chance? I mean, there were (and are) good reasons for not making a pedestrian mall in the area, but improving the sidewalks and the road widths around the area back in the 1980s when they still could (today it would be considerably more expensive) could've worked wonders. Wasn't Art Wren's restaurant in the building or part of the property where Katz's is today in the mid 60s? Yep, 1963 directory confirms Art Wren's Restaurant at 616 Westheimer. I have vague memories of lower Westheimer from the 70s, if not earlier. I remember it having a lot more charm before many of the grand, early 20th century (or earlier?) houses were demo'd or burned down. I was just in Katz about a week ago. So, are you guys saying that the building contains part of an older one, or is it all new? ArchFan...I have vague memories of lower Westheimer, as well. I remember extra-large bungalows and massive dilapidated homes...many were rentals for artists, and a mix of smaller houses, some converted into businesses (Empana place) and those oak-lined streets. I still find it visually fascinating...enjoyed cruising those skinny, anything-but-predictable streets the other night. There was a house that sat on the curve, at the top of Westheimer, it had a 3rd story greenhouse-looking structure sitting on a traditional, rectangular house. I studied that place for a long time. I believe it has been removed. I remember it well. I was at the University of St. Thomas from 1964 to 1968 and then my wife and lived on West Main from 1971 to 1973. Katz's building was new construction. It's situated differently on the site than the old Tila's building was (Tila's had quite a bit more setback from Westheimer). As I recall, the exterior walls were left standing and propped up on the inside with iron braces. If the walls came down the City would not have granted them the "0" setback that the building currently enjoys. Reallistically speaking however, there is not much left of the original building. 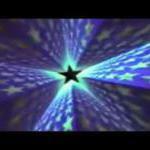 Does anybody remember where gay bar called The Midnight Sun from the late 70's/early 80's was located? I seem to recall it being right near the curve (around where Katz is now) but a friend told me it was further in on lower Westheimer, probably near Numbers (then called Club Babylon I believe). I do know it was on Westheimer but just cannot recall exactly where it was. Was it demolished or could it still be there as something else. Great thread! Your memory is correct. It was across the street from the Chicken Coop, which IIRC was at Stanford and Westheimer or Stanford and Avondale. Katz's is at Crocker and Westheimer, which would be out of the frame to the left in the pic below. Awesome photo, THANK YOU SO MUCH !!!! 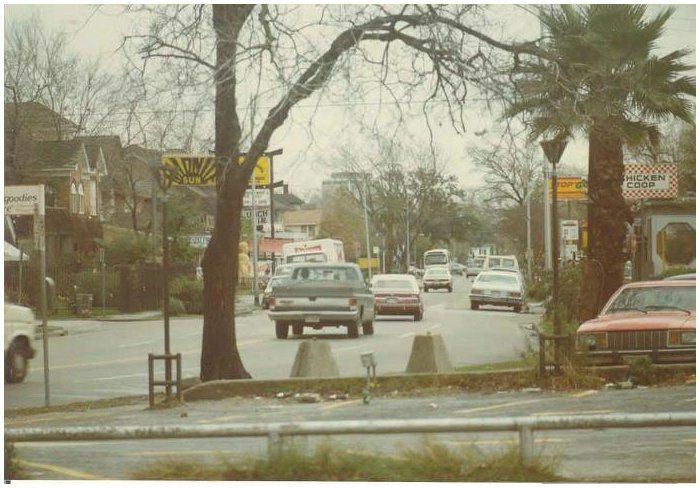 It looks like the corner of Stanford & Westheimer looking east toward Main Street, and I'd say circa 1981, 82 or earlier. Thanks again, much appreciated! Look at that old iron on the road. A GM Dreamliner "Fishbowl" transit bus, a K-car, a B-body Buick, a GMC C/K, and I think that's an AMC on the right. All long gone, probably except for the GMC C/K. I still see that bodystyle on the road regularly. The front of Katz's is the original facade. The rest of the building is new construction. I remember when the building was gutted for the coming 'M Bar', the side and back walls were removed and the front was shored up. This image faces east. And the strange orange car on the right is a Mercury Bobcat - the nicer Pinto. What was the Stop N Go on the right was torn down and is now Osaka. We won't discuss Midnite Sun. And the strange orange car on the right is a Mercury Bobcat - the nicer Pinto. It looks like Stop N Go (and the other businesses there) were converted houses (which is what many businesses in Montrose were like). Neat! Most of the businesses were in converted houses, but the Stop N Go was your basic classic CMU convenience store box. Looks like the perspective is throwing me off. I see the curve and I know it's facing east, but Midnite Sun is 524 Westheimer, which would place it in the middle of the block, whereas the Stop N Go is farther out in a building that still exists (though is vacant) at Westheimer and Whitney. According to TSHA, Stop N Go adopted that name in 1983, though that wasn't the logo they were using by the late 1980s. I'd reckon that they closed then when Diamond Shamrock bought the company and purged it of non-fuel locations? Hard to say. It was Montrose in the 80s. Well, it was 1995 when Diamond Shamrock bought it, so it probably lasted through the 1980s. It does look like that entire row was bulldozed sometime in the 1980s for....reasons? The old joke is that if you remember the 80s you weren't really participating. I thought that it was if you remember the 1960s you weren't really there. In all seriousness, though, what did happen to that row? Was there a big fire? The 80s tend to impair any remaining memory wisps of the 60s. According to Google Earth, all four(?) were wiped clean by 1989 but the strip mall wasn't built until 2000 (according to HCAD). Razing of the Chicken Coop was a media event, with Mayor Whitmire at the controls of the bulldozer that took the first swipe. Mid to late eighties started the clean-up of Lower Westheimer, due in no small part to a wider awareness of AIDS. Along with the Chicken Coop and the Midnight Sun, the Boobie Rock closed its doors, as well as the Asian massage parlors and modelling studios. IIRC, disgraced Houston developer J. R. McConnell was somehow connected with the strip center; he died around the same time (suicide in a Galveston jail cell). The front portion of the MIdnight Sun was demolished, and the remainder extensively remodeled. It's now occupied by The Cat Doctor. The cruising of Lower Westheimer which had been going on since at least the early 80's got a boost from Marvin Zindler. He issued a report about the scandalous goings-on ("Kids are blasting their radios! They're drinking! They're picking up girls! "), which caused the traffic to increase exponentially overnight. After a year or two, people had had enough, and the constable's office cracked down on a couple of consecutive weekends, putting an end to it. This also would have been about the time when "No Turns After 8PM" signs were put up on the side streets, to discourage the cruising which was widespread in those days.